Astander's UK agents, Simplex-Turbulo announce the installation of two significantly sized pits, which provide a much more economic and straightforward alternative to the usual double docking bed and give Astander a significant advantage over other shipyards who are not able to dock vessels with deep drafts or who have thrusters which need to be removed. The forward pit, sitting longitudinally along the centre line, has dimensions of length 15m, breadth 10.5m, and depth 1.5m, the aft pit lies athwart ships with dimensions 21m x 7m x1.5m. The new pits allow for distances of 3 – 4.5m between the hull bottom and the bottom of the pit. The first vessel to use the facility was the CGG Symphony whose thrusters were removed for overhaul. 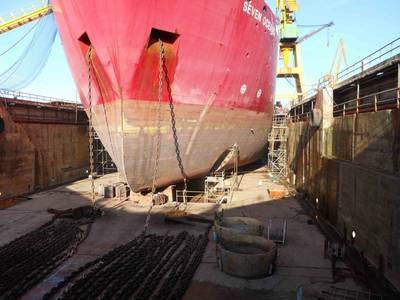 The new pits are already proving popular with many other ship owners and managers looking for dry docking facilities for deep-drafted vessels in southern Europe. Currently in the dock and utilising the new facilities is the vessel Seven Oceans, owned by Subsea7.